Though this payload did not trigger the exact previous vulnerability, it produced console errors suggesting it was exploitable. Note the LR_PAGE_URL value above which breaks out of the string using two backslashes — one provided by my payload in the URL, while the other seems to be added by the code that processes the input. This code obviously isn’t handling escape sequences correctly, which is the cause of the DOM XSS vulnerability. While identifying affected sites was straightforward, tracing individual vulnerabilities to a responsible vendor was not. In many cases, an affected site may not have triggered the payload on every page view due to the nature of the components involved. Further, a given page view could have used a combination of Flash components which only added to the complexity of identifying the source. As shown in the above example, LiveRail’s Flash Ad Player was affected by this issue, so I began researching contacts in order to report it. Since LiveRail was acquired by Facebook in 2014, I felt good about reporting it — until I realized LiveRail was out of scope per Facebook’s bug bounty terms. @RandyWestergren @LiveRail @facebook Go ahead and submit to the Bug Bounty portal and they will route/make a call on scope. Understandably, I wasn’t entitled to a bounty payout, but I wanted to get the issue patched regardless. Thanks to Alex’s quick response, I reported it to Facebook on 2016-03-09 and, after a little back and forth with their security team, it was patched on 2016-03-10. Note the vulnerable parameter, in this case, is the windowLocation string within the params property. Reaching out to Inform ended up being one of my poorer experiences with vendors. 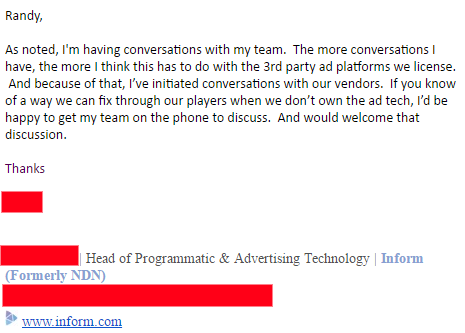 Not only were they completely unresponsive in my numerous attempts of contact (until I phoned their office directly), their “Head of Programmatic & Advertising Technology” was quite dismissive of the report and its risks (at least at first). Nevertheless, Inform’s team came to eventually understand the issue, its impact to customers and end users, and worked to get the issue resolved. After a bit of discussion on the issue, I learned that Inform actually licensed their player through Akamai. After some group discussion between the two organizations, Akamai patched their Adaptive Media Player, resolving the issue for Inform as well as any other users of the player. Akamai had to be contacted multiple times to get status updates, but apparently released a fix on 2016-03-31. Again, the hostedAtURL was vulnerable to the same issue as the other products in this post. I reported the issue to Adobe on 2016-03-11 and they released a fix with a security bulletin (CVE-2016-1036) on 2016-04-21. Though plans are being made to phase out Flash entirely (at least in Chrome), it’s here to stay for the short term (much to the dismay of the security community). There are likely many additional products in the wild affected by this vulnerability, most of which have probably been vulnerable since their initial release. 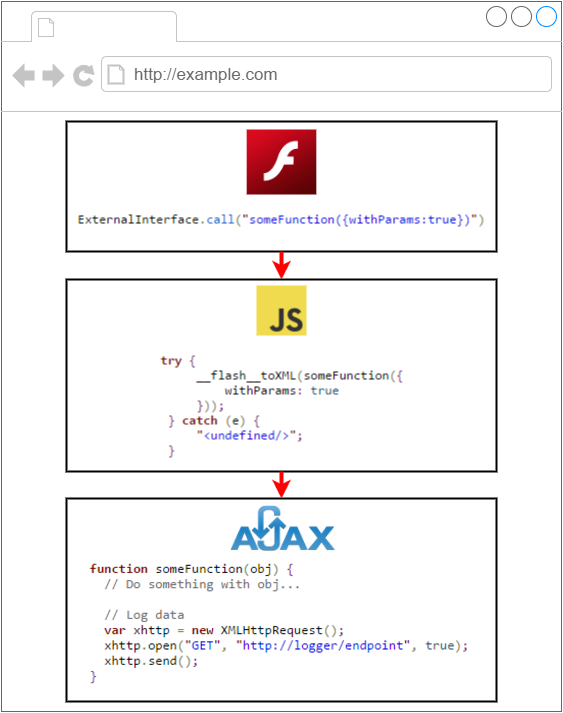 Until Flash has an end-of-life date announced, serious abandonment of it on the web is likely to be slow, meaning we will continue to discover and mitigate vulnerabilities in similar components for the foreseeable future.